Last night, Brit fashion designer, Christopher Raeburn gave an intimate workshop at the pop-up Shinebright Studio in the Loading Bay of the Old Truman Brewery. 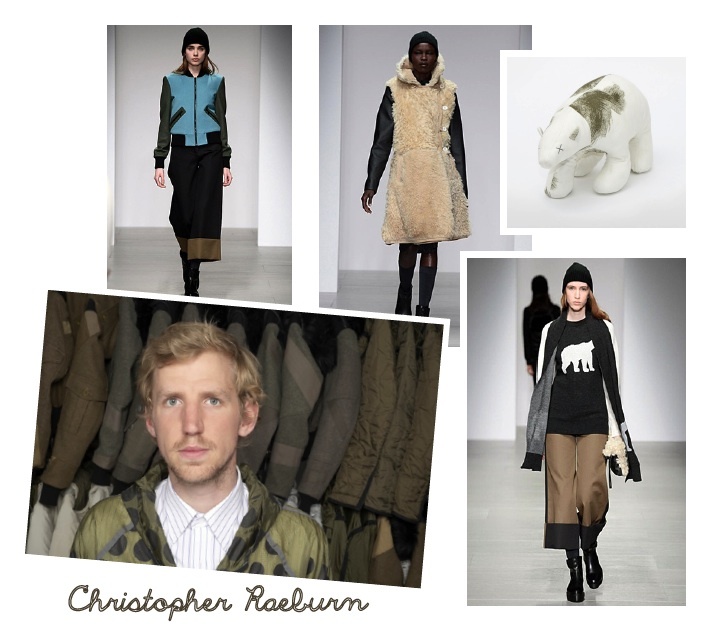 A/W14 Collection referencing the Arctic landscape and the first female polar explorers – sheepskin Siberian Officer coats, merino jumpers, jumper dresses and polar bears! Raeburn offered an inspiring insight into his world of creativity, not trend-driven but relevant to today’s ever-changing landscape. The evening itself was an ideal platform for his impending S/S15 offering due to close the first day of collections at London Fashion Week next Friday. Of course, what makes this artist stand out as a main stayer, is his resourcefulness and ability to stay true to his ‘RE-MADE’ ethos in which he uses only sustainable militarian fabrics. It is clear to see his definitive style from one collection to the next – desirability in being functional and fun in being prepared. In the space of eight years, Raeburn has evolved from a part-time pattern cutter who first experimented with a used parachute in a free warehouse space in Luton above a J Cloth factory, to an emerging talent with 60 or more stockists worldwide and collaborations with fellow pioneers in outerwear including Moncler, Victorinox (of which he is Artistic Director) and more recently Barbour. What remains a constant throughout Raeburn’s foray into fashion, from his humble beginnings to his now cult status, are his efforts to poke fun at the seriousness of it all. With animal mascots as exclusive gifts he is still very much the boy from Kent.